Thank you to eos for kindly sponsoring this post. All opinions are 100% honest & completely my own. I love eos lip balm! 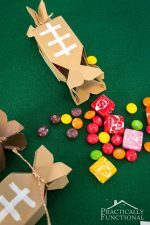 I always have one in my purse or in the car, and they make perfect holiday gifts for family and friends too! 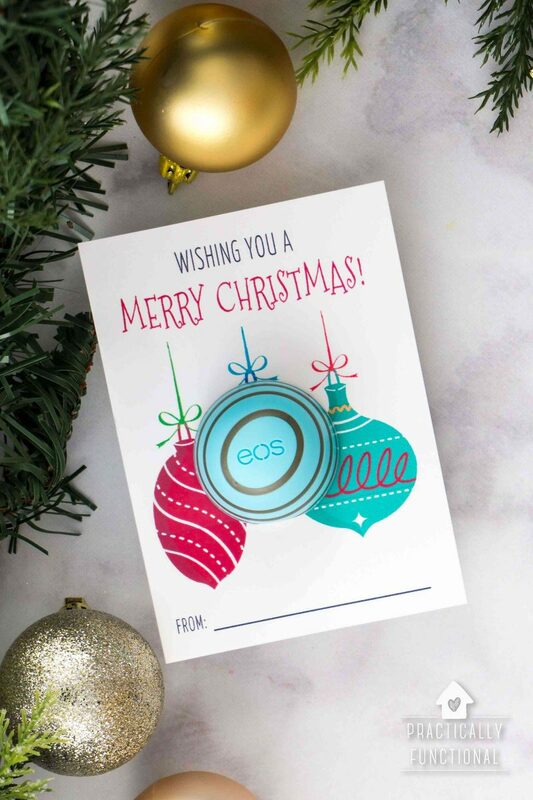 I decided to spice up a gift of eos a little with these cute printable holiday cards. 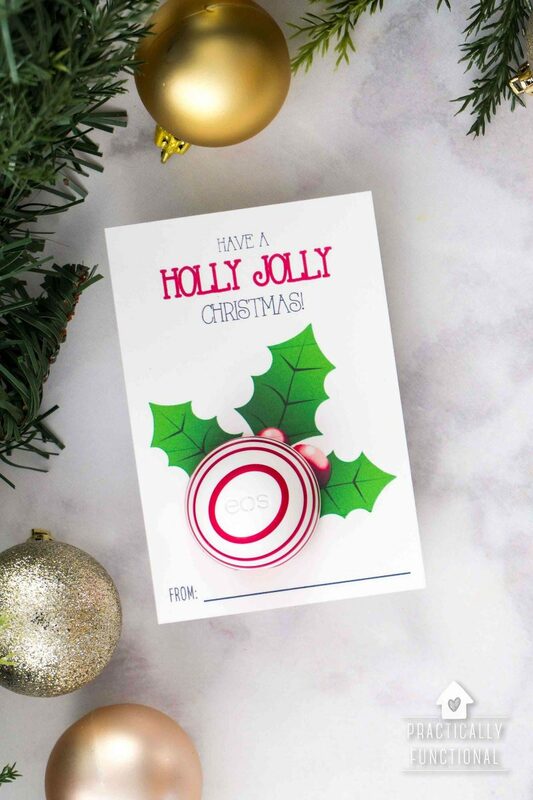 All you need to put together a cute DIY eos Christmas gift is a couple of containers of eos, scissors or an X-acto knife, and these free printables! 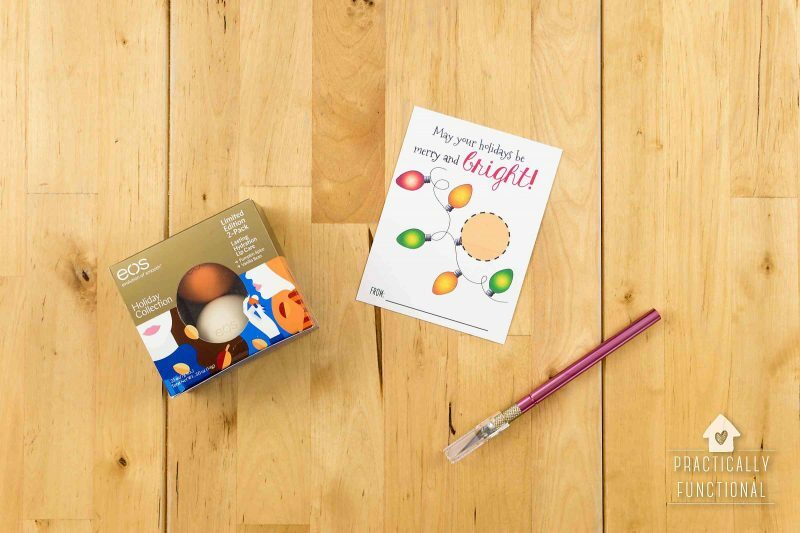 These free printable eos lip balm Christmas gifts are the perfect gift for family, friends, neighbors, teachers…you name it. 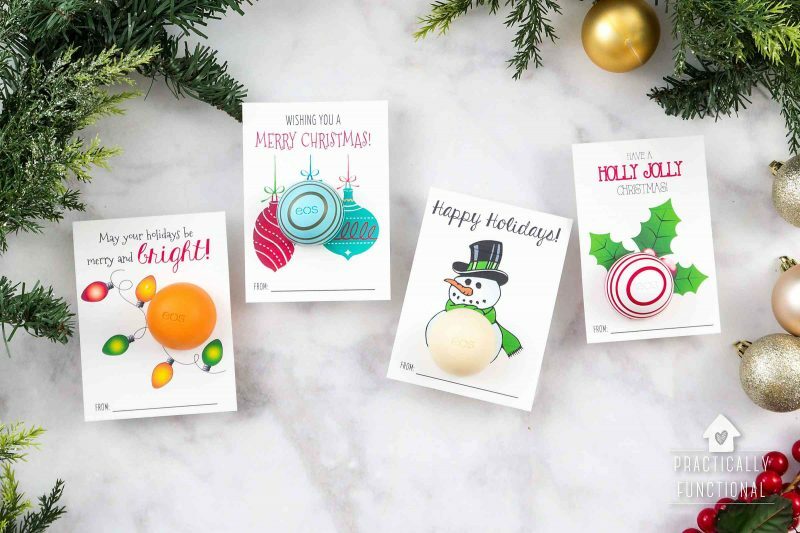 Everyone loves a good lip balm, and eos comes in super delicious holiday flavors like peppermint mocha, peppermint cream, sparkling ginger, and pumpkin spice that are the perfect addition to these printable gifts. 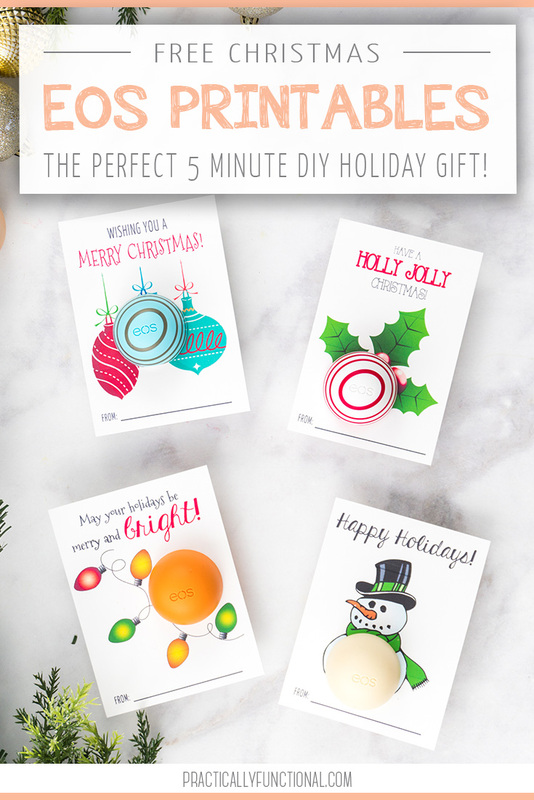 Plus there are four different printable cards, so you can find the perfect message for everyone on your gift list. 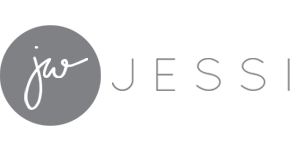 You can find eos at local retailers like Target, Wal-Mart, Ulta, CVS, Walgreens, etc. 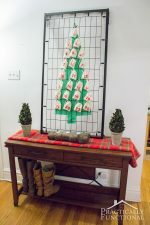 so stop by, grab a few, and make a bunch of cute gifts this holiday season! 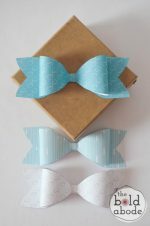 Print out your Christmas gifts on white card stock using a color printer. 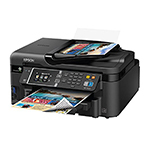 Make sure that you tell it to print at “Actual Size” and don’t let your printer “Fit to page” automatically. 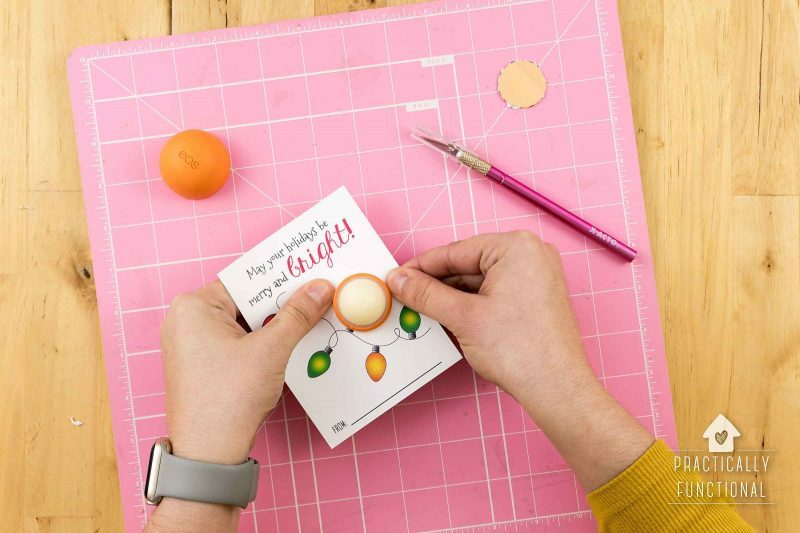 If your printer does shrink down the printable a little bit, you may need to cut out the circle slightly larger to fit an eos inside it. 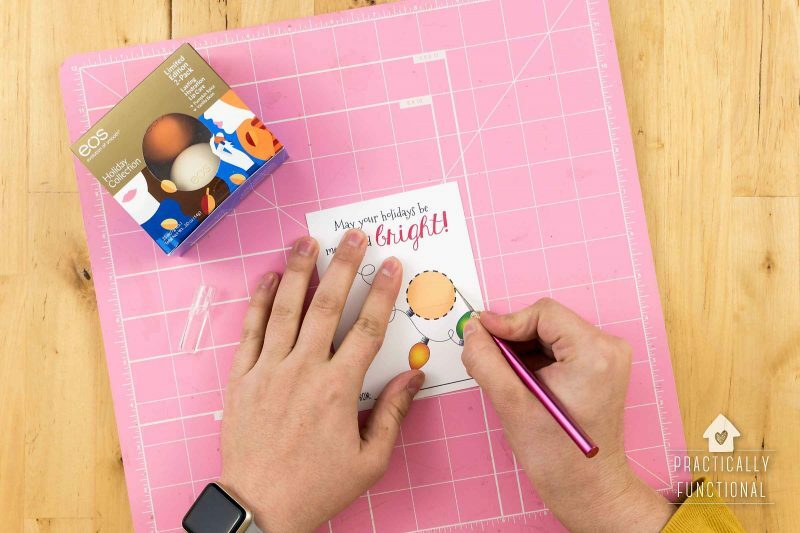 Use an X-acto knife to cut out the circle on the dotted line. 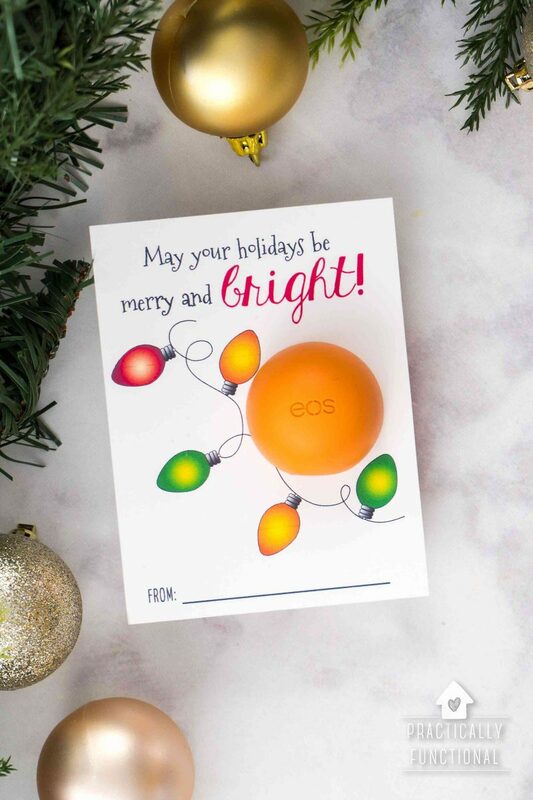 Grab a holiday eos lip balm and open the container by twisting the cap off. 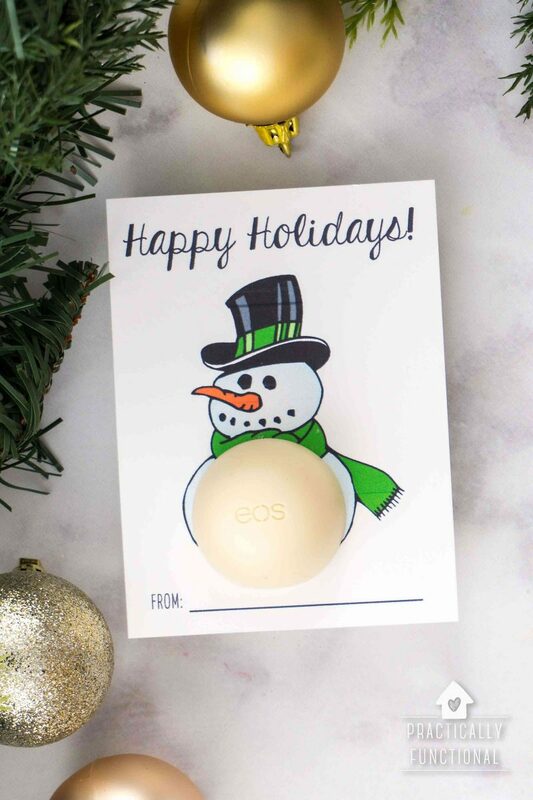 Stick the bottom part of the eos (the part with the lip balm) through the card from the back. 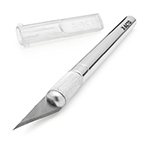 Then all you need to do is twist the cap back onto the container from the front, sign the card, and you’re good to go! 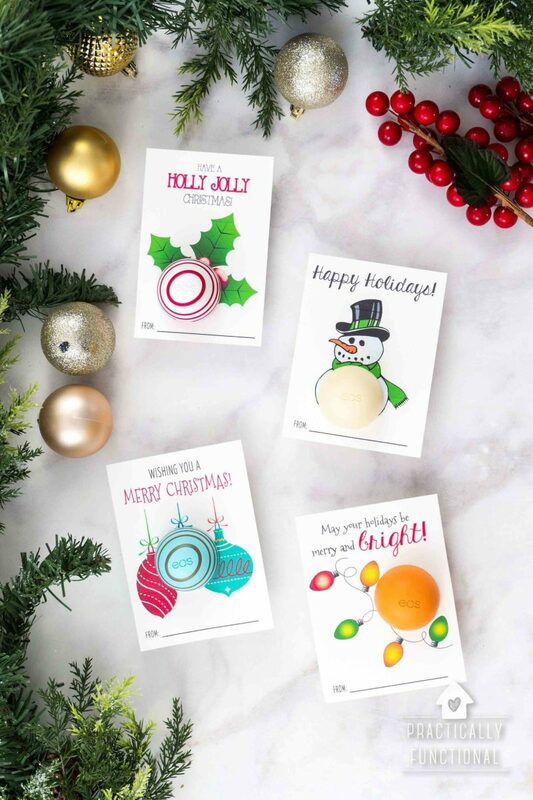 There are a bunch of eos holiday flavors, so feel free to mix and match different colored eos containers with any of the four free printables I’ve provided below! 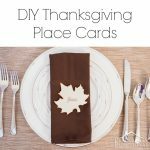 Want to share this free printable with your friends? 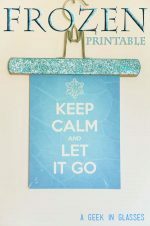 Just click any of the share buttons on the left to share with Facebook, Pinterest, Twitter, etc.! « How To Remove Yellow Sweat Stains From Your Clothes The Easy Way! 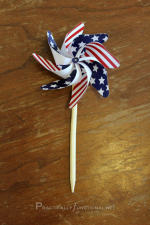 I can’t get this to download. It opens the webpage but I can’t download the file. If I try to print from the page, it’s all messed up. Any suggestions? Are you using a computer or a mobile device? When you click the link to the printable from a computer it should just open a window with a “Download PDF” button.